The iPad has a problem that we should all wish to have: It’s too damn good. The battery life and standby battery life are superb, the screen is pretty, the apps are nice, and the thing is powerful enough it can last for years. That’s wonderful for all of us consumers, but it is not great for Apple or any other company building a tablet device. They want us on the same yearly upgrade cycle we have for our phones. A concept, as IDC noted in February when it reported a big slump in tablet sales, consumers have largely rejected. Which is why every year Apple tries to build some cool new feature into the iPad to lure us away from our old, perfectly good iPads. Unless you’re an illustrator, this year’s iPad, won’t be doing any wooing. 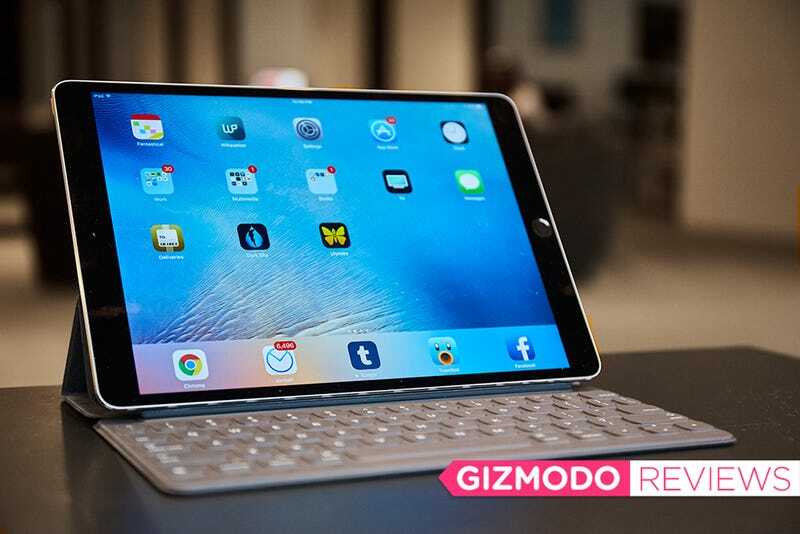 An iPad for people who hate laptops. A larger size means a roomier keyboard. The 120Hz refresh rate is currently useful only for artists. In 2015, the company tried to build upgrade fever with a big 12.9-inch iPad Pro that introduced the Smart Connector, a magnetic connector that was perfect for attaching and powering a keyboard. In 2016, it brought the Smart Connector to its 9.7-inch iPad Pro. Personally, that made the iPad Pro worth it for me, and I use mine daily, for everything from checking my mail and RSS feeds in the morning before work, to reading comics and watching movies while in transit. The new 10.5-inch iPad Pro that’s supposed to replace my 9.7-inch iPad Pro can do all those things as well, and it does them while giving me nearly an inch more display but only being .18 inches wider and .47 inches taller. The small increase in size, consequently, gives me a much roomier keyboard. It’s still not quite normal sized, but it feels surprisingly spacious after a year of cramped typing. The new 10.5-inch iPad Pro really isn’t that much larger than the 9.7-inch one. When Apple made the iPad larger, it also upgraded its guts. At WWDC last week, Apple talked a lot about the faster A10X CPU and 12-core GPU packed inside. That all sounds impressive until you remember that apps don’t ever really lag on an iPad. Most apps are built to provide a near universally pleasant experience across the iPad lineup, that they’d be hard pressed to take enough advantage of the new iPad Pro’s impressive guts. Even if they do, you’re not likely to notice any time soon. The new keyboard is slightly less cramped. 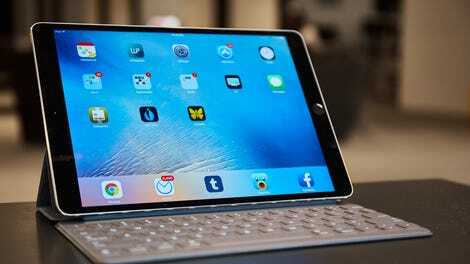 The biggest feature in this new iPad, and the only noticeable one, apart from its sheer size, is its display. The refresh rate on it is a whopping 120Hz. That means the display can refresh 120 times a second. This is useless for iOS games, which are all capped at 30 or 60 frames per second, and it won’t benefit you when streaming something from an app, as most apps stream at 30 or 60 fps too. The only time you’ll see a benefit is when you’re drawing. See, as good for art as as products like the iPad and Surface have gotten over the years, they still can’t deliver that instantaneous paper-like feel when you’re drawing. It’s a different kind of friction, and, there’s always just a hint of lag with every pen stroke. A screen that’s refreshing twice as fast as any other drawing tablet on the market goes a long way towards fixing that lag. It really does feel faster that drawing on my 9.7-inch iPad. If I used the Apple Pencil for anything more than coloring book apps, then this upgrade would feel like a necessity, but I’m not an artist, and if you aren’t either, then making a trip to the Apple Store just to upgrade to this iPad is kind of a dip move. Apple has put itself in an enviable predicament. It’s built the best tablet you can spend a chunk of change on, and every new update for the last few years has been a refinement. Last year, Apple refined the typing experience. This year, it’s refined that drawing experience. Maybe next year, it will give us an iPad that demands an upgrade. For now, unless you’re an illustrator, or entirely iPad-less, save your money. As good as the new 10.5-inch iPad Pro is, it isn’t worth it. Same great battery life and performance. Slightly larger footprint than the 9.7-inch iPad, but with nearly an inch more screen real estate. 120Hz refresh rate make this iPad great for drawing. If you’re an artist, it might be worth a consideration. Keyboard is slightly roomier, but still not full-size.